Manhattan College participates in two Model United Nations conferences each year: a fall conference in Washington, D.C. and the spring National Model United Nations (NMUN) Conference in New York City. This hands-on, participatory experience helps students acquire expertise on a particular country, which they represent at the conference. 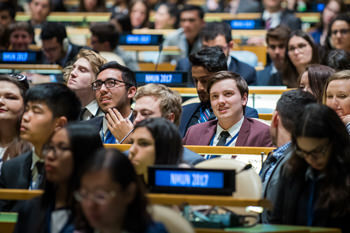 The NMUN experience offers a unique opportunity for students to better understand the inner workings of the United Nations and other international organizations while building skills in diplomacy and compromise. Each spring, more than 2,500 college students and faculty from all over the world work feverishly to propose resolutions that addressed issues surrounding regional conflicts, peacekeeping, human rights, women and children, economic and social development and the environment. By providing a diverse group of informed participants a forum in which to discuss global concerns in a context which closely parallels the "real world," the NMUN conference acts as one of the most effective tools for teaching students the dynamics of multilateral diplomacy and international relations. Students who are interested in participating can do so for credit by taking POSC 457: Model United Nations in the spring, or as an extracurricular activity in the fall. Model United Nations is open to all students, however students in the School of Liberal Arts may benefit most from membership. For more information, contact the club moderator Pamela Chasek, Ph.D. at pamela.chasek@manhattan.edu. Learn more about what's involved in a National Model UN Conference, from researching your delegate country to understanding issues the impact the world.